Every college would have had a cricket team. 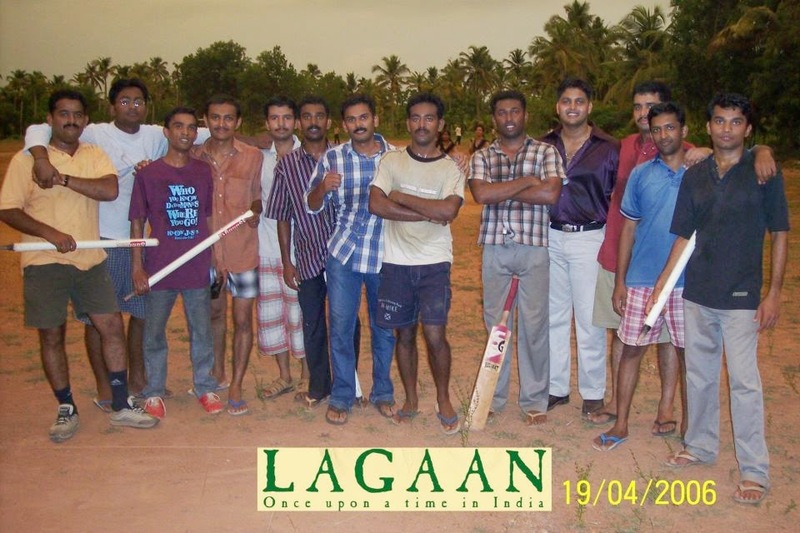 This was the Rajagiri cricket team (2004-2006). We all did MBA together. We did not win any cricket tournaments during our playing days because we did not participate in any tournament in the first place. We played every evening. Before I begin to write about how we played, I should first give a short introduction about the players in our team. Let me write about the people from left to right. Subash : We have millions of photography pages in Facebook these days. But 11 years ago, this guy walked around with a camera. He was the official photographer of the batch. He would have all the photos of all of us. He is now a HR big gun. Subash is wearing a green shorts, blue socks and is holding a stump in his hand. The stump in his hand is a clear indication that he was in the winning team that day. Prason Christopher Robin : Yes! That's me in that red shoes. I am holding a stump too :P I used to be a leg spinner and a tail ending batsman. I was fast and performed well when the ladies were around. Arun Simon: We used to call him Simo (Rhyming with Remo) because he had a Yamaha bike. We used to beg him to give a ride on his bike. Attender : I forgot his name. He was the hostel attender. He used to play with us when we run short of 11 members. Vyasan : This guy was the Vice captain and the opening batsman of the team. He was very good in almost all sports. He was the second best dancer in college. The best dancer in our college was Clement (Clement is not in this picture). Midhun Raj : The guy with the chequered shirt and full pants. What should I write about this fellow? He fooled us for more than 3 months that he did his under graduation in IIT Chennai. We used to call him IIT because of that. Midhun and I were partners in crime during the college days. We were always caught near the Engineering college ladies hostel or the MBA college ladies hostel. When we go missing from the cricket field, our friends know where to find us. Midhun was also the captain of our cricket team. Captains are known for their captaincy traits. There are captains who are known for their strategic field placements. If you see the above picture clearly you can see that he has placed the bat strategically too. Jayakrishnan : The guy in silk shirt and formal pants. He played cricket in formal attire all the time. He will not slide nor fall down while playing. He literally believed in the phrase " Cricket is a Gentleman's game"
Unni Cherian : He was a silent guy who did his part well. I have not interacted with him much during the college days because of his calmness. Dilip Cyriac: He was the Rahul Dravid of our team. He can bat at any positions and he was a stylish batsman. Sunil Thomas : Finally Sunil. This man had the biggest girl following in our college. One junior girl was crazy about him. But he said "My country comes first. I don't have time for love"